The English Toy Terrier is generally healthy and hardy, but patellar luxation is known in the breed. This is a condition where the kneecap slips out of place, either temporarily or permanently. It is more common in small breeds and is often treated with surgery. There are no compulsory health tests but Kennel Club Assured Breeders are strongly recommended to use the breed club screening test for patellar luxation. Dogs are X-rayed and tested under sedation, then graded on a scale of 0 to 4. Breeders should only breed from dogs with scores of 0 or 1. Kennel Club Assured Breeders are also strongly recommended to use the Brainstem Auditory Evoked Response (BAER) test for canine deafness, although cases in English Toy Terriers are rare. Sounds are played into each ear and brain activity is monitored for the electrical impulses which are created in response to hearing a sound. English Toy Terriers are faithful to their owners but may be aloof with strangers. Confident and alert, but not aggressive. The English Toy Terrier is a devoted companion and will not enjoy being left alone all day. They can be left happily for two to three hours. The English Toy Terrier is comfortable living in any sized house; a garden is useful, but not essential. He is equally happy living in a town or out in the countryside. He needs around 30 minutes' exercise a day but will be happy and ready to go for much longer. The English Toy Terrier is good with children but interactions should always be supervised. His small stature means he can be easily injured if play is too rough. English Toy Terriers are intelligent and will generally pick things up quickly. Training is easier if discipline is established from a young age. They can be lazy when it comes to house-training and don't always like to go out in the rain. Stay on top of it and they will be toilet trained soon enough. The English Toy Terrier has a short coat which needs brushing once a week. They usually moult but as their hair is short the mess is minimal. Adaptable to most living conditions. Can't be left alone for long periods. The English Toy Terrier is the oldest of the native toy breeds. 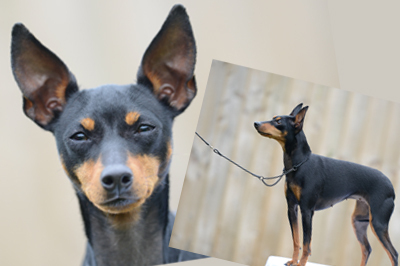 Formerly called the Miniature Black and Tan Terrier, it was thought that any terrier type of this colour could use the name, so it was changed to English Toy Terrier (Black and Tan). The breed is on the Kennel Club's vulnerable native breeds list.